There are good reasons to have a professional inspection performed on the new or used home you are buying. Buying a new house is probably the largest investment decision you'll ever make. The entire process is filled with emotion and stress. A professional home inspection will substantially reduce the risk for your large investment in a new home. Educate yourself as much as you can about the quality of your new home, before closing. Building a new home is a tremendously complex endeavor. It involves many people, usually split up into sub-contractor groups, each working on different parts and systems of the house. Even for the best builders, it's nearly impossible to complete this process without missing something. Maybe it's a plumbing fixture that didn't get tested for leaks, maybe it's an over sand on drywall, an outlet that isn't working, or any one of dozens of minor problems that can easily be overlooked in such a major undertaking. We will find such problems while it is still early enough for you to bring them up with the builder and have them corrected before you close and start moving in. An inspection from Camm is unlike any other. 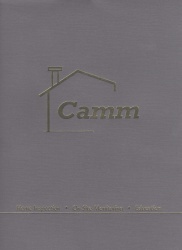 Your inspection report is given to you in a Camm folder that is designed to keep all of your information in one place. Our reports are easy to read. Depending on the property your report will be between 20 and 80 pages. Our inspectors take an average of 100 pictures of the property during the inspection. These photos are put on a CD and included in your folder.